SWD Import Export Co., Ltd.
SWDGems is the leading gemstones wholesaler with 3 decades experience in the business. People at SWD have well service minds to take good care of all our nice and prestigious clients. 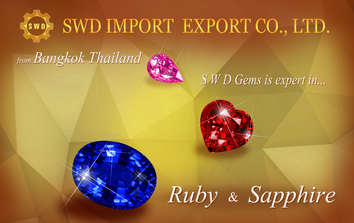 SWD Import Export Co., Ltd. guarantees quality of the stones with the neat cutting for the best result of customers. WE SERVE YOU RIGHT!